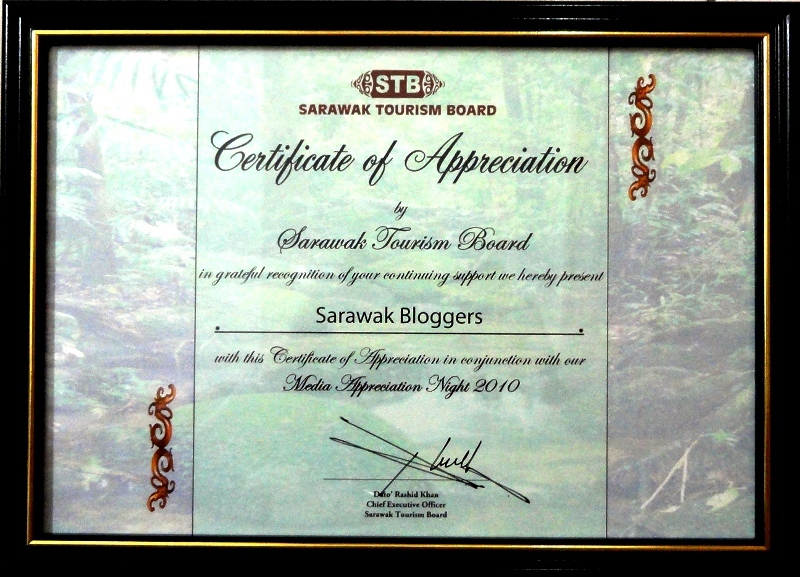 The Sarawak Tourism Board (STB) tonight awarded a certificate of appreciation to the Sarawak Bloggers for efforts to promote and support the tourism industry in the state of Sarawak. Attending the Media Appreciation Award on behalf of the Sarawak Bloggers was four of the top management namely Cyril Dason, Fahri Izzad, Amiey Alen and Norman Goh. 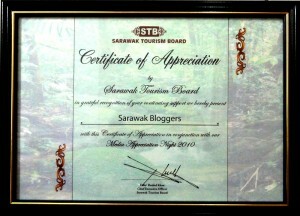 A collective statement from the core team expressed an utmost delight over the the appreciation given by STB, and they further mentioned that the pride of having such an appreciation should be well shared by all Sarawak Bloggers, as Sarawak Bloggers is a collective effort of over 300 bloggers world wide, mostly Sarawakians. As a matter of fact, the Sarawak Bloggers will not be where it is today without the continuous support and fantastic backing from an awesome group of bloggers in the community. The Sarawak Bloggers community led by the Core Team will be looking into new and exciting ways to enhance Sarawak as the ultimate travel destination by doing every tiny bit to promote tourism for our lovely paradise.